Fossgate once formed part of the south easterly route from the Roman fortress of Eboracum and was named after the River Foss, it runs from Pavement down to Foss Bridge. 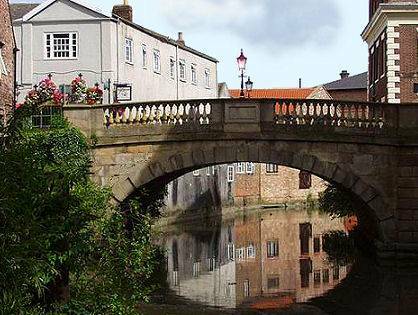 In York's Viking era a wooden bridge was constructed over the river connecting Fossgate to Walmgate on which the seafood market was situated. In the medieval era a chapel dedicated to St William stood on the bridge. The current handsome stone bridge dates to 1811. The tradition of selling fish was retained in Fossgate in Victorian times when a fish market was constructed in a building which now houses an Italian restaurant. Fossgate was once also known as Tricker's Lane after some dodgy market traders who operated in the area. Rowntree's chocolate empire was founded in a small Fossgate cocoa business belonging to Mary Tuke, a relative of Henry Isaac Rowntree. Today, the street contains chocolatiers and confectioners and some of the finest restaurants in York as well as a variety of shops, bars and cafes. In 1327, 80 Lincolnshire archers were buried under one stone in St Clement's churchyard on Fossgate, following a skirmish with soldiers from Hainault while fighting the Scots for King Edward III. St. Clement's possibly dated back to pre-Conquest times, then became part of a twelfth century Benedictine nunnery. Although records show this church was still in use in the early fifteenth century little is recorded after that. 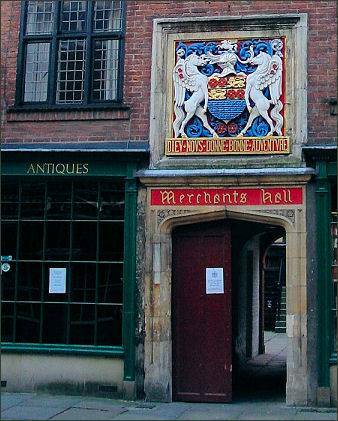 The Merchant Adventurers' Hall (pictured right) is accessed via a passageway from Fossgate (pictured left). Once one of the most important buildings in the medieval city of York, construction of the Merchant Adventurers' Hall commenced in 1357 and was completed four years later. It was built by a religious fraternity of men and women known as the 'Guild of Our Lord Jesus and the Blessed Virgin Mary'. In 1430 the fraternity were granted a royal charter by King Henry VI and renamed 'The Mistry of Mercers'. It was further granted the status of the Company of Merchant Adventurers of York by Queen Elizabeth I in the sixteenth century. The hall occupies the site of a former Norman mansion. The main part of the building consists of the Great Hall, where meetings and the business of the guild took place. The Great Hall is a timber-framed structure and was built over a five-year period. It is the largest timber-framed building in Britain still standing and used for its original purpose. The green Governor's Stall was moved to the Great Hall during the Georgian period and originates from the Assize Court at York Castle. The fireplace is an Elizabethan addition. Several late sixtenth and early seventeenth century buildings stand on Fossgate. At the back of numbers 13-14 is Morrell Yard where a medieval well was discovered, full of rubble and potential antiquities, at a depth of around 16 metres, it was considered too deep and too costly for excavation. The Grade II listed Blue Bell stands on Fossgate and is the smallest pub in York. Records reveal it was in use as a pub in 1790. The first purpose built cinema in the city opened on Fossgate in 1911. The building is now occupied by a furniture shop.